Freshman in the Food For Thought class went to Metropolis Coffee Company’s roastery to learn about the life of the Coffee plant. Students were welcomed into the state-of-the-art roastery where they got a behind-the-scenes look at each step of the process. Metropolis is dedicated to serving a stellar cup of coffee, but what’s even more important to them is respect. Respect is at the core of the company’s philosophy; from farmers to consumers. It was an eye-opening lesson on the effort it takes to be a responsible part of the production chain. In the second unit of the course, Light, Sound, and Time, the Juniors have been investigating the guiding question, What does life sound like?. As a part of their investigation, they have been examining how sound travels, how we hear sound, and how we make and control sound. At the end of this unit, the students will use the culmination of their learning to construct their own guitar. In order to do this, they visited the Chicago Music Exchange to gain a better understanding of the anatomy and the acoustics of a guitar. The purpose of this Field Experience is to gain an understanding of the functions of the different parts that make up an instrument. Students collected information in order to build their own guitars by speaking with experts at the Chicago Music Exchange. The Sophomores in Forbidden Books have been investigating the guiding question, How are minds fanaticized?. Specifically, the students have been examining why books have been forbidden for dogmatic reasons through the study of The Bible and The Koran. As a part of their investigation, they visited the Muslim Community Center to learn more about the history and tenets of Islam from their Youth Coordinator, Aminah. Aminah shared insight on her own connection to Islam and the difficulties of teaching Islam to Muslim youth because of its portrayal by the media. The purpose of this Field Experience is to dispel myths and to build some cultural understanding of Islam. Students will visit a mosque and speak to the Youth Coordinator of the Muslim Community Center. The Juniors in Light, Sound, and Time have been focusing on light and investigating the guiding question: What would life look like without light? . In order to illuminate answers to this huge guiding question, students are examining how light could be captured and manipulated. As a part of this investigation, they built and experimented with pinhole cameras to better understand the role of light and time in creating photographic images. The class visited the darkroom at the Latin School of Chicago and met with photography teacher, Betty Lark Ross to learn more about the power of light. The purpose of this Field Experience is to see the concepts of light waves and how we perceive them come to life. Students will experiment light using their hand-built pinhole cameras. In the third unit of the Biomimicry Elective, the students have been investigating the guiding question, What would a fungus do?. In this unit, students have been investigating fungi and their role as decomposers in order to rethink their definition of waste. The students are drawing inspiration from fungi and other decomposers’ ability to recycle nutrients to turn linear systems into circular systems to design their own closed-loop systems. As a part of this investigation, they visited the Plant Chicago whose mission is to make healthier and more efficient cities by developing and sharing the most innovative methods for sustainable food production, energy conservation, and material reuse. The students got a first-hand look at an aquaponics system and the practical applications of closed-loop systems. The students visited the Plant Chicago to learn about the practical applications of closed-loop systems. The students explored an aquaponic system and attempted to design their own in order to demonstrate their understanding of closed-loop systems. Students in the Game Changers Elective have been pursuing the guiding question, How do game components come together?. In this unit of this game design course, students have been examining the different physical components that make up a tabletop game. They investigated the fundamental design of boards, cards, and moving pieces in order to design and build a game of their own. As a part of the creation of their game, they visited The WasteShed Creative Reuse Center to find recycled materials to build a prototype of their game. The WasteShed is dedicated to providing Chicago with an organized, affordable, and reliable resource for repurposed art, craft, and school materials. The purpose of this Field Experience is for students to buy materials to build a prototype of their original board games while learning to find value in repurposed materials. Students will work in small groups to find the materials they need. Students in the Ollywood Elective have been pursuing the guiding question, What makes a movie a movie?. In this course, students have taken on the role of a film critic and are learning to evaluate films based on 3 stages of production: pre-production, production, and post-production. As a part of their investigation of pre-production, students have been learning about the role and creativity involved in scouting locations for film settings. For this Field Experience, students were given the opportunity to propose a location worthy of the time of a location scout. And there were more! The ultimate winner, though, despite the frequency of its use as a setting — in films such as The Dark Night, Batman Begins, Wanted, and The Blues Brothers — is Lower Wacker Drive. So the students explored the different landscapes of Lower Wacker Drive and captured photos to visualize the story they want to tell. The purpose of this Field Experience is to investigate the guiding question, what is the role of a location scout?. Students will familiarize themselves with the role of the location scout as one part of the pre-production process in the making of a film. Students will also create a short storyboard demonstrating their understanding of the responsibilities of the scout. Students will walk around Lower Wacker Drive to collect photographs to create their short storyboard. Juniors in the Rhetoric class met with Alia Bilal from Inner-City Muslim Action Network (IMAN) at the Dr. Martin Luther King, Jr. Living Memorial in Marquette Park. Students have been pursuing the guiding question, how do voices work to unite people, divide opinion, and transcend conflict? In the third unit of this Humanities course, students are asked to look at how rhetoric inspires and mobilizes?. The Action Project for Unit 3 asks students to create “an original artwork” that “speak[s] out on issues that receive little attention” and “inspires collective action.” In order to contextualize such a statement and experience it in person, we journeyed to Marquette Park to see the monument there to Dr. Martin Luther King’s protest march in 1966, known as the Living Memorial. 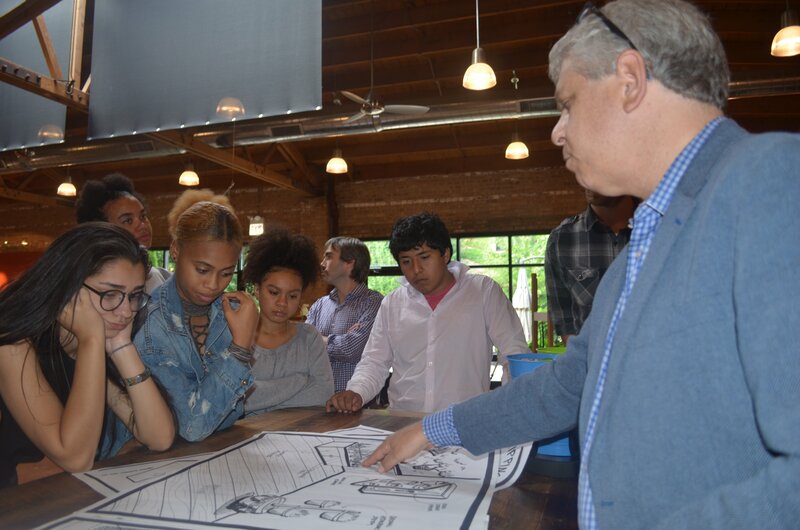 Juniors in the Design & Engineering class met with Michael Prince, the president of Beyond Design. In this STEAM course, students are investigating what it means to be a designer. Through this investigation, students have learned that being a designer is far more than conceptualizing and designing a new product. Being a designer requires empathy, compassion, patience, expertise, and a whole lot more. This was confirmed by our visit with Mr. Prince. He shared stories about the trials and tribulations of starting his own design firm. He stressed the importance of empathizing with his clients, working with a diverse team, and embracing the iterative nature of the design process. It was a unique and eye-opening experience to get a behind-the-scenes look at a successful design firm. This term we are studying design, and how to make things better. The purpose of this FE is to introduce the class to professional designers and to get them to think like designers. Students talked to designer Michael Prince and toured Beyond Design to understand the work of a designer. The Sophomore Stories class and Senior Journalism class visited Forced From Home, an interactive exhibition presented by Doctors Without Borders to educate the public about the refugee crisis. GCE students engaged with stories and materials gathered from refugee camps, sea rescue missions, and emergency medical projects around the world to get closer to the real experiences of people displaced by violence and extreme hardship worldwide. Students in Stories and Journalism are investigating how to effectively communicate through storytelling. Students were guided through the exhibit by experienced Doctors Without Borders aids who have seen firsthand the impact of the refugee crisis. The tour guides and components of the exhibit are tasked with sharing the experiences of the refugees in an impactful and responsible way. The students’ experience through this immersive exhibit gave them insight into the elements of effective and responsible storytelling. In preparation, students learned about the exhibit and its aim to address SDGs 10, 11, and 16. Students in the Poetic Justice course visited the Poetry Foundation to investigate the guiding question, “What story is yours to tell?”. In the first unit of this Humanities Elective course, students have been studying, analyzing, and critiquing political poetry from a range of poets discussing local and global issues. In addition to looking at the poets’ political message, the students have also been examining their utilization of poetic devices to help get their message across. With a draft of their own political poem in hand, they headed to the Poetry Foundation where Amy Lipman led them through an exercise that challenged them to re-examine their own writing. Amy led the students in an examination of documentary poetry and poetry of witness and they were posed with the question, “Is the story you are telling, yours to tell?”. The students dissected different styles of writing and took some time to re-read and revise their own poems. Students in the Rapid Prototyping course visited mHUB to investigate the vast possibilities of rapid prototyping. mHUB is Chicago’s innovation center for physical product development and manufacturing. The students have been investigating the guiding question, What can machines do that hands can’t?. In the first unit of this course, students have been investigating the line, and concepts such as, networks, slopes, intercepts, and angles as the foundation for all things that are built. At mHUB, our host, Bria showed us around the impressive facility and explained the uses of different spaces, tools, and machines. During our tour, we met engineers who talked in-depth about different types of machines, we met designers working on prototypes for products getting ready to launch, and we met artists creating their masterpieces. It was an eye-opening experience to see the possibilities and essentially, the necessity of rapid prototyping in the 21st century. Juniors in the Design & Engineering class talked to bike expert, Andrew at Working Bikes in Pilsen to learn about the mechanics of bikes and the purposes that different types of bikes serve. In the second unit of this STEAM course, students have been pursuing the guiding question, how are bikes designed and engineered to solve specific problems?. In their pursuit of an answer, students have been studying the concepts of weight, speed, acceleration, velocity, and mass and their effects on simple machines such as the wheel, the axle, and the pulley. To gain a better understanding, the students visited Working Bikes where they prepped bikes to be transported. Working Bikes gives new life to discarded bicycles and distributes them as tools of empowerment to local and global communities. On the day the students visited, a shipping crate was waiting to be filled and shipped to the Kingdom of Lesotho in Africa. Andrew, the volunteer coordinator at Working Bikes showed the group how to prep the bikes and they got right to work. The experience was informative and extermely humbling. The purpose of this Field Experience is to investigate the guiding question, how do bicycles impact lives?. The students talked to experts to investigate the evolution of bikes and how they are put together so that they can then design a bike that suits a person’s specific needs. The students talked to bike shop employees about the parts that make up a bike, their purpose, and the choices designers make when choosing to use certain parts over others. Seniors in the Economics class met with a financial consultant at the Capital One Café. In this STEAM course, students are pursuing the guiding question, how do we make choices in a world of limited resources and limited time?. In the first unit of this course, students have been analyzing the value of risks, taking into consideration time, cost, and utility. As a part of this first unit, students have also been calculating and assessing the value of college. The experts at Capital One Café stressed the importance of short- and long-term goal-setting, saving for emergencies, and finding happiness and balance in all of it. The purpose of this Field Experience is to investigate the guiding question, how do you determine value?. The students will talk with a financial consultant at Capital One Café to learn more about value, utility, and risk. The purpose of this Field Experience is to investigate the guiding question, how does rhetoric inspire and unite?. The students learned about both the history that led to the Chicago Freedom Movement’s protest march and the movement to preserve the memory of that action with the Living Monument. Justin reflects on how he is able to explore his passions through Action Projects and how GCE helped him find his voice.